By Dennis W. Viau; modified from several recipes. 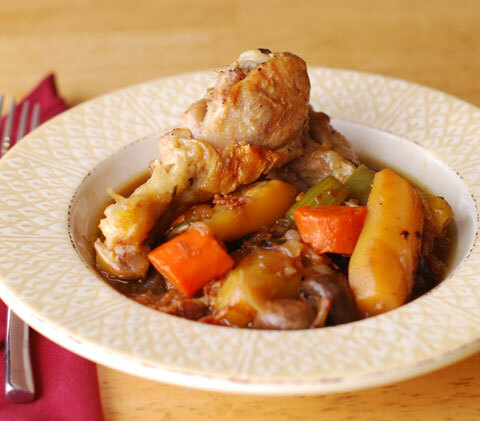 Chicken Fricassee has a long history, first appearing in books in 15th century Europe. I think of this comfort food as country cooking, the cuisine of working-class folks who lived on economy. Originally made with the simplest of ingredients, the dish has enjoyed some enhancements over time to make it appropriate for a Sunday family dinner. Heat the oil and butter over a medium-high flame in a large skillet. Season the chicken with salt and pepper. Brown the pieces and 1/3 of the pancetta until well browned, about 10 to 15 minutes. The pancetta might need to be removed early to prevent burning. Transfer the chicken to a platter and wrap with foil. The pancetta can be set aside in a small bowl. Chop the vegetables. Remove most of the oil from the pan and discard. Saute the chopped onion, shallots, garlic, and thyme sprigs about 3 minutes, stirring often. Add the potatoes, celery, carrots, and browned pancetta. Cover the pan and cook over medium-low heat 10 minutes, stirring occasionally. Add the mushrooms to the pan, season with salt and pepper, and return the browned chicken to the pan. Cover and cook until the largest chicken pieces, typically the breast meat, reaches an internal temperature of 165°F to 170°F (74°C to 77°C). Transfer all the cooked ingredients to a larger casserole dish, arranging for presentation, and cover with foil. Keep warm, such as in a low (200°F/93°C) oven. Pour the chicken stock into the skillet, keeping any brown bits (the fond) that are in the pan, and add the vermouth, remaining pancetta, Herbes de Provence, and optional prosciutto. Bring to a boil and reduce by about half. Then strain and discard the solids. The reduced stock can be thickened with cooked flour mixed into about half a cup of cooled stock and then stirring the mixture into the pan of concentrated stock. Bring to a boil to thicken. Pour the finished stock over the chicken and vegetables in the casserole. Serve immediately. *I keep cooked flour in the cupboard. It is better than raw flour for thickening because it doesn't have a raw flour flavor. I heat a skillet with about half a cup of flour in it and cook it over medium-high heat, whisking constantly, until it starts to change color. Then I transfer it from the hot pan into a bowl to cool. Store in a jar until needed.